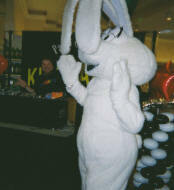 ﻿ Kidsdance as a Marketing / Promotional Tool - Reach a selective target captive audience! Kidsdance as a Marketing / Promotional tool? 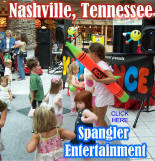 Kidsdance helps bring point-of-purchase advertising to a whole new level. What's better for General Mills to re-enforce its brand than "little Johnny" dancing to the hokey pokey with the Trix rabbit before he gets his very own box of Trix cereal off-the-shelf. 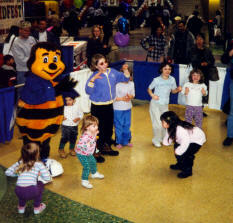 Byerly's, an upscale grocery chain owned by Lund Food Holdings, Inc. features the Kidsdance Show to rave reviews for over seven years at Family Fun Days at several of its locations. What's Kidsdance doing in the frozen food section of your local grocery store? Marketers have searched for many ways to breakthrough the clutter of traditional advertising to reach their target audience. How about an innovative unconventional way to command attention from your demographics? One General Manager of Byerly's was recently overheard saying, "Many of these families walked in our store three hours ago and still haven't left - can you imagine that"?! 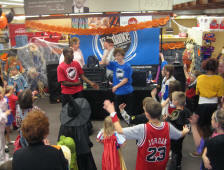 Kidsdance DJs have noticed many familiar families traveling to more than one branch to make it to another Kidsdance! 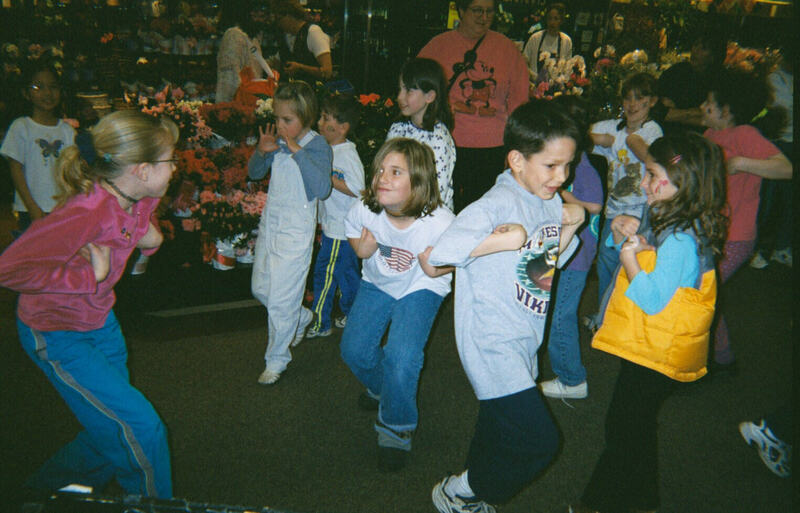 Over the years Kidsdance has helped open book & shoe stores, help jewelers create attention at crowded malls for the Holidays, help celebrate the 25th anniversary of one of the first Target stores, warmed up the crowd at CD release parties, and entertained anxiously awaiting lines to ride the "Wild Thing" at Valley Fair Amusement Park. Anywhere there's a line of people waiting & watching, there's an innovative opportunity for promotion & a need for Kidsdance DJs to entertain a crowd! Kidsdance has performed for many sponsors including the St. Paul Saints & Minnesota Twins baseball games; for KS95 FM (Hubbard Broadcasting) at Grand Ole Day for Clear Channel radio stations - KOOL 108, KDWB FM, K102 FM at events from area malls (including the Mall Of America) to Kidfest at River Centre in St. Paul; & for Coca Cola at crowded Minnesota area beaches. Kidsdance connects sponsors with schools! Kidsdance has given out thousands of FREE meal coupons for Old Country Buffet and Home Town Buffet restaurants at hundreds of venues each year. 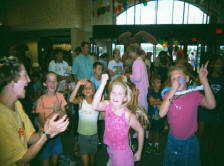 Most schools are excited about receiving an added value for their dance at no cost to them. Kidsdance is actively seeking new sponsors to help offset the event cost of Park & Recreation programs with advertising consideration as well as extra prizes for giveaways for schools. No other advertising media is this "up-close & personal" in reaching your target audience! * "The Trix Rabbit" is property of General Mills, Inc.
"OC Bee" is Property of Home Town Buffet, Inc.